This is the first illustrated edition of Mary Shelley’s Frankenstein, originally published in 1818. Von Holst’s design evokes the heroic, heavy-limbed figures of Fuseli. The setting, with its dramatic lighting and medieval tracery, is thoroughly Gothic in style. The subject is taken from the short tale Undine (1811) by the German writer Friedrich de la Motte Fouqué (1777-1843). The heroine Bertalda is tormented by a host of fantastical creatures, conjured by the wicked supernatural creature, Kühleborn. These have been sent in an attempt to drive her away from the household of the hero, Huldbrand, and the lovely water-nymph Undine. The female character is Bertalda, who has entered the happy household of Huldbrand and the water-nymph Undine. The nymph's evil uncle, Kühleborn, intent on keeping the marriage between Undine and Huldbrand intact, tortures Bertalda mentally, haunting her with evil spirits. The subject is taken from the fairytale, Undine, by Friedrich de la Motte Fouqué (1777-1843). This sexually explicit design clearly shows the influence of Fuseli's works in this genre. According to an early report, von Holst was actually commissioned in his youth by the painter Thomas Lawrence (1769-1830) to create such compositions for George IV. The relatively high level of finish might imply this drawing was a commission rather than a work created for private pleasure. By tradition these legs are said to be those of Maria Anne Fitzherbert (1756-1837), one of the lovers of George IV when Prince of Wales (and, as she was a Catholic, illegally his wife from 1785). George commissioned a number of pornographic drawings from von Holst. 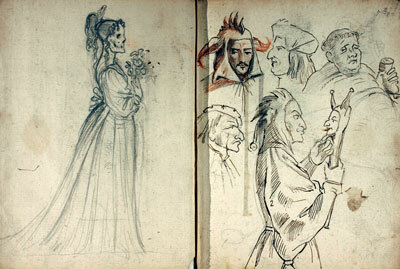 This sketchbook is filled with drawings by Fuseli’s follower von Holst. The range of subjects exemplifies the romantic and supernatural themes that pre-occupied this artist. There are also written notes, including a sheet of proposed ‘Night Sketches’ that includes the tantalising suggestions of ‘Opium’, ‘the Vampyre’, ‘Punch Orgies’ and ‘the untrue lovers last Dream’ as subjects for art.